Operator safety is essential on the shop floor at all times. 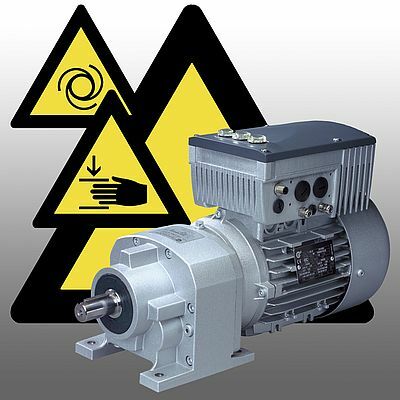 When a safety circuit is activated because a safety cover or door has been opened, any danger of accidents through rotating machine parts must be ruled out. On the other hand, high availability of machines is vital. Economic efficiency requires quick restarts after safety-related shutdowns. SK 200E distributed frequency inverters from Nord Drivesystems feature several safety functions which, depending on the switching device, enable safe shutdown procedures in high risk applications that comply with Category 4 or Performance Level e according to EN 13849-1. SK 21xE and SK 23xE models feature a certified safe pulse blocking device as well as digital inputs for the "Disable Voltage" and "Quick Stop" functions. These enable Stop Category 1 (controlled motor braking in line with SIL1), followed by Safe Torque Off (SIL3-compliant) or Stop Category 0 (SIL3-compliant) according to EN 60204-1. Since the voltage supply is blocked without switching off the control or power electronics, the units remain on standby and are ready to be switched on without re-initialization after the safety circuit is closed. In addition to high availability, the inverters' safety technology provides more economic benefits: contactor components are not required, and since the safety functions are activated electronically, there is no need for regular maintenance or exchange of electromechanical contacts.